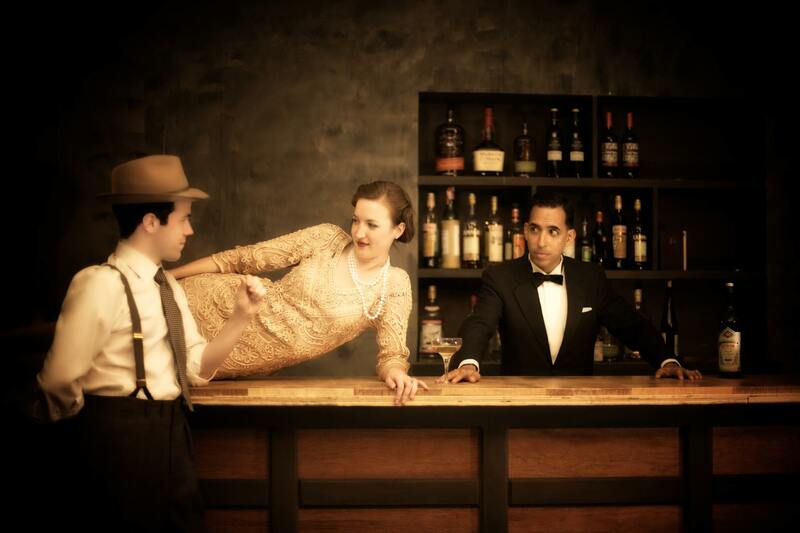 “The Speakeasy”: The Twenties Roar Again at Boxcar Theatre, S.F. “The Speakeasy” invites us into the dark, forbidden past. The doorway to our evening is secret. We meet a man on the street in a colored hat. He gives us our instructions, our tickets and map to the “door. Entering by a secret door, we are confronted by 20s ambiance, fully dressed rooms, flappers and gun-toters in slinky dresses and double-breasted suits. All the trapping of the Roaring Twenties surround us, and we immersed in the Prohibition Era that you have seen movie screens for decades. Six or seven separate rooms are in full swing with scenarios running full-tilt, performed by a cast of more than thirty actors weaving their stories, simultaneously. House rules require that speaking be confined to staff wearing red carnations. Unlike some participatory shows, you are the fly on the wall: present, but out of the scene, unless you can find subtle ways to participate in the show. Although we have been given an initial destination, we can wander freely for three hours, in an Exploratorium of performance art. Late diners be forewarned: the libations and snacks offering are light, the journey is enough to sate your appetite for immersion in that wild era. Modeled on the illegal, hidden clubs of the Prohibition Era, 1920-1933, the Speakeasy offered underground privileges for the well-heeled. 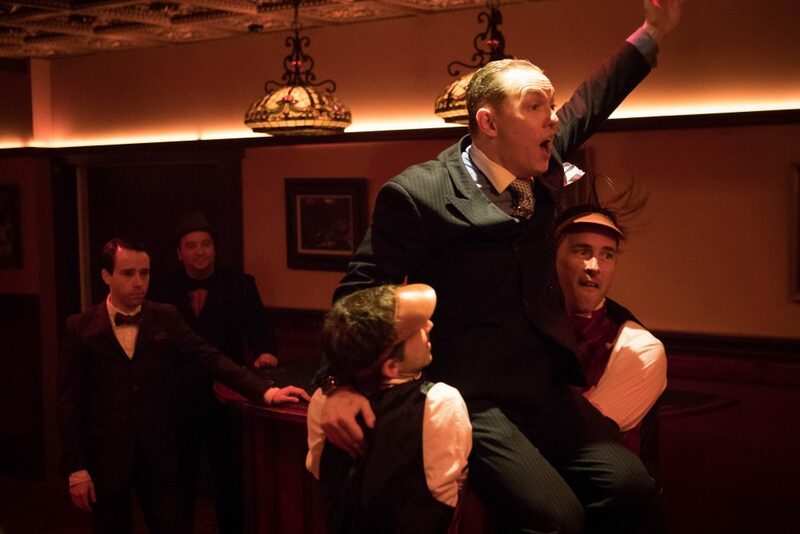 But it also served booze for the “down-on-their-lucksters,” mobsters, and random citizens seeking the escape of illicit alcohol and the community of the bar. The term “Speakeasy” comes from the need to keep the club a secret, enhanced by the thrill of a possible police raid at any moment. While anonymity is required from patrons, dressing up is mandatory. Its an upscale, stylish celebration of the Underground. You won’t get into “Speakeasy” in your sequined high-top Converse Chuck Taylors, saggies and flying dreads. Secretive and formal is the bye-word. With an overpowering SHHHHH! factor, it is verboten to describe the details to strangers. Brian Martin, Jason Pienkowski carried by Anthony Agresti and Brent King. Photo by Peter Liu. What is the core of this experience that we are dressed for? How does it feel to be human wallpaper for the personal stories and songs being enacted for us? Boxcar calls it Performance Art, that stimulates our minds and hearts, making us a part of the stories playing out around us. For the right audience, these are thrilling adventurous surroundings. Immersive theater comes in many flavors, and audience participation helps to shape the stories. 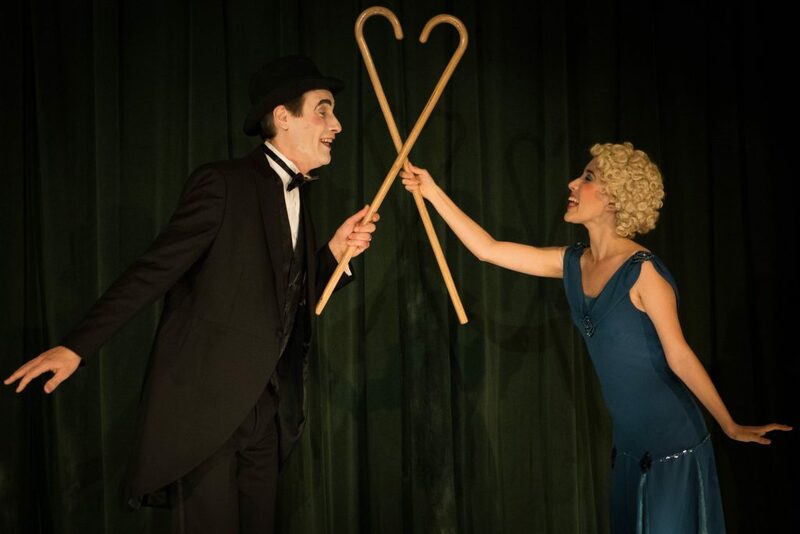 While “Tony and Tina’s Weddin” required real audience participation, a show like “Sleep No More” in New York City has been called “Promenade Theater” because the audience walks through crafted scenes from Macbeth, as it unrolls. “Haunted at the Medieval Banquet” in London features another scenes focused on medieval food and dress, where an audience member may be called on to assist. At “The Dickens Fair” in San Francisco, you can dance at a Victorian party with a live band, or play parlous games, take art lessons, or attend period plays. In these fairs, the script plays second fiddle to the sensory surround. Other Bay Area site-specific theaters include the We Players, Ubuntu Theater, and formerly the Atmos Theater, which have new versions of the Odyssey, Macbeth, The Frogs, and Othello. They choose evocative settings like Fort Point, Angel Island, a Persian rug shop in North Berkeley, or the Palo Alto woods. As you wander the hills and take in ocean views, you become a part of familiar stories in striking settings. “The Speakeasy,” written by Nick Olivero and Bennett Fisher, stretches across 1500+ lines of multiple, simultaneous stories . But you will only catch some of these lines as you move from room to room. The actors move around, too, and may interact with another story, and then flee, again. The Cabaret provides the one set theater club experience, with you as the audience, ordering drinks and very petite appetizers. 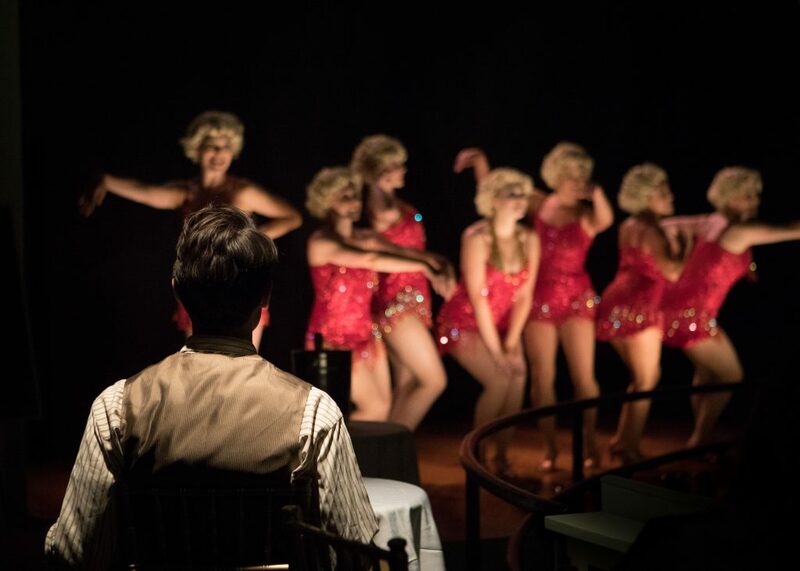 A full experience requires you to sample the offerings on more than once: the illicit bar, crooked casino, vaudeville cabaret, peep show, backstage dressing room, and more. Will you feel cheated because you cannot “seen it all” in one visit? 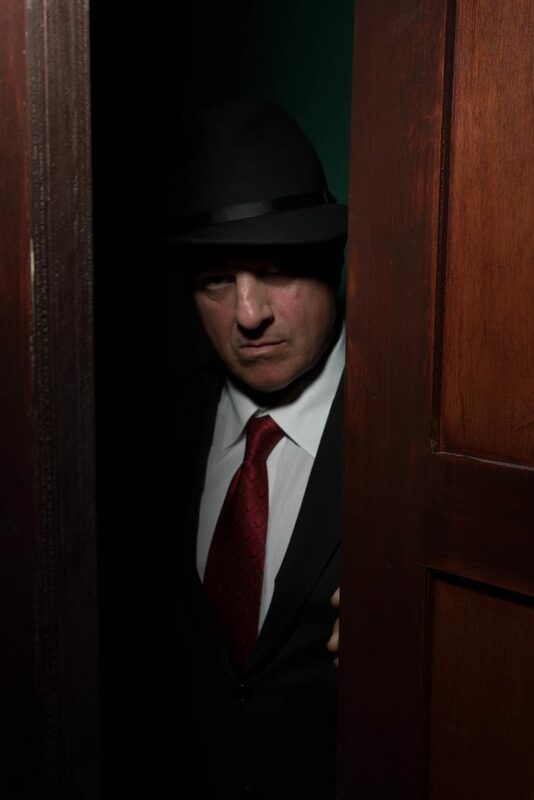 Or will you be thrilled to return and carve a new path through the Speakeasy maze of rooms? The night we attended we met two couples returning for another dip. Be sure to have a hearty dinner, first. Then get your spats on, your jeweled headband, your fox throw and your ascot, and give in to Speakeasy’s charm.